Orchards at Orenco offers 40 one bedroom and 17 two bedroom apartments. Vibrant Living at Orenco Station is close to shopping, coffee shops, restaurants and grocery stores. Orchards at Orenco is built to Passive House energy standards, an extremely energy-efficient home in which a comfortable interior climate can be maintained without active heating and cooling systems. 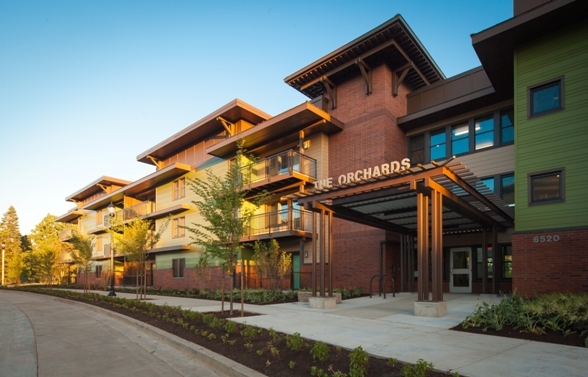 Orchards at Orenco is the largest multi-family Passive House building in the United States. Learn more about this project by watching the video by Ankrom Moisan here. This is a Tax Credit building. Learn more about Tax Credits units. Breathe easy. Smoking is not allowed in any REACH property.